Yesterday Vattenfall invited press and media to its heat and power plant - Reuter C - in Berlin. German TV-network - rbb - covered the event (watch here - starts 00.20.55). Marcus Witt, Vattenfall´s VP Asset Management Heat held a press conference and displayed the project on site. SaltX and Vattenfall are now finalizing the installation of a large-scale pilot plant that will store excess wind power in SaltX energy storage to be released as district heating during peak hours. Germany, including the city of Berlin, has an ambition to shut down all coal-based heating plants and replace them with renewable energy. To succeed, supply and demand need to be balanced with a storage solution, which is why Vattenfall is considering SaltX solution. “After a year of planning and execution, we are excited to soon be up and running and look forward to demonstrating our solution. 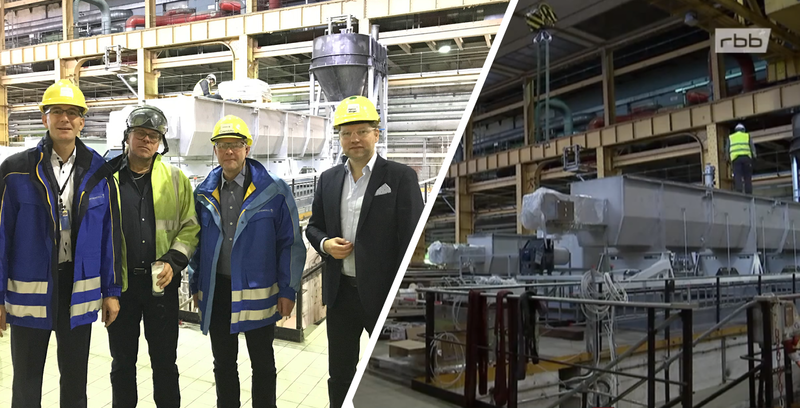 I’m impressed by the level of visibility and attention the project gets both from Vattenfall and externally”- Karl Bohman, CEO at SaltX Technology. German news sites Energate-messenger.de and Zfk.de also reported directly from the event. SaltX Technology develops and sells patented energy storage technology, which is marketed under the brand SaltX ™. Customers consist mainly of major global OEM partners such as Alfa Laval, Mobile Climate Control and Rheem. SaltX Technology's stock is listed on Nasdaq Stockholm First North. FNCA Sweden AB is SaltX Technology’s Certified Adviser. For more information, visit www.saltxtechnology.com.